Hello! I am Aziz Saint Laurent. Some friends call me Aziz number one, because I am one of the best private guides in Tangier. I was brought up in an old Berber family with a stable tradition of welcoming and hospitality. From my childhood I got the idea that any visitor should be welcomed and honoured. I majored in Foreign Languages at the University of Fes, which is considered to be the oldest university on the whole world. I was lucky to travel all over Europe, and it significantly expanded my horizons and enriched my knowledge of foreign countries. After I finished college I decided that I should dedicate myself to the tourism industry and organize private tours in Tangier and other interesting places. I thought it would be my pleasure to help people discover the exotic and unique world of Morocco, get acquainted with its rich culture and glorious history. 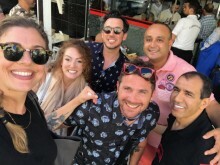 During all the years of working as a private guide I had millions of clients, and some of them were celebrities: the member of the U2 rock-band, Richard Harris, famous for his starring in the Harry Potter movies, and Baz Luhman, the film director. 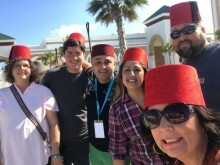 I offer various tours all over Morocco, but my specialty is Tangier – my hometown. I offer my service of a private guide to different kinds of groups: individuals, family members or big companies of friends. I have an individual approach towards each and every of my clients, and I offer personified tours. It means that we can discuss the itinerary and come up with the most suitable variant for you. Aziz is by far the best tour guide I have ever worked with. My daughter and two friends, students in Spain, were planning a trip to Chefchouen so I read refiews and contacted Aziz who inmediately answer all my questions, understood the experience I wanted for them, taylor made a truly remarkable expierence for them starting in the airport, recommending the hotel, traditional dishes, camel trekking, kasbah, cave of hercules and kaftan shop. They felt wellcomed, cared for, secure and as if they had know Aziz for years! He is so knownledgeable, respectful, responsible person and makes a tourist feel like a local and is so proud of his city! Dont hesitate to book your tour in Morocco with him...this is the best piece of advise you will get from a truly grateful mom... Thanks again Aziz!